Recently, I was criticized on an RV blog for not recommending the latest gizmo in hitches and for being from the ‘dark ages’. The RV enthusiast felt that a new hitch design was far superior to what we had installed on a vehicle featured in one of our towing seminars. I did not bother to go online to respond that I had tested the new hitch when it was first introduced and found some issues with it. Nor did I tell them that we had already removed a few of these hitches from rigs that people had brought to us after experiencing towing problems. On these rigs, after applying all of the recommended adjustments, the only solution was to remove the hitch and install a completely new, albeit, less expensive solution. So why do we like the old tired and true hitch design and if it is so good, why are so many people running off to buy these new designs? The main reason is that 90% or more of the people who have a conventional weight distribution setup have never towed with a hitch that is properly configured. The reason that this gentleman never experienced the degree of control that we had achieved during our test drive is because his tow vehicle and trailer combination was not properly setup. In fact, his rig needed very little to become dramatically more stable; better shocks on the Suburban, the hitch shank re-drilled, and the ball mount set at the correct height and angle with the correct pressure on the torsion bars. He had all the pieces thrown together but the hitch had never been ‘dialed in’. When RV enthusiasts are not happy with the way their rig handles, they often assume that they need a better hitch or a bigger tow vehicle. Think of it this way – no matter how good your car is, if I get under the front end and mess up the alignment settings I can make it almost impossible to drive even though the hardware is all still there. A wheel alignment would be much cheaper than a new car. Sometimes the problem is not the hitch system but a hitch receiver that is too weak to properly transfer weight. If you properly measure your setup you will know this because no matter how much pressure you apply to the torsion bars, the front of the vehicle refuses to be pressed down. Occasionally, this is due to a spring bar that is too light but more often it is weakness in the receiver that makes it impossible to transfer weight and thereby, get stable towing and a smooth ride. S, before you rush out to buy a new hitch, make sure your current one is setup the way it should be. So how do you account for all the people who believe that a new hitch type is dramatically better than the established designs? Perhaps they managed to adjust the new hitch better than they had adjusted older models. On a weight equalizing hitch, the various components should match the towing requirements for the rig. 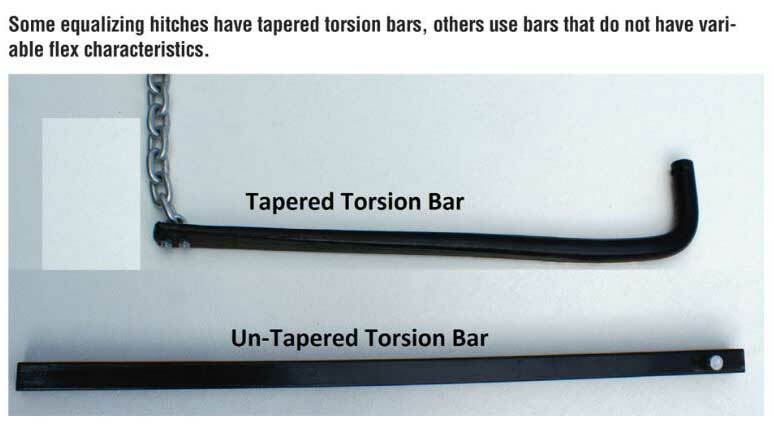 On some hitches the torsion bars are not tapered so they do not bend nearly as easily which tends to produce more weight transfer. Just about any straight spring you look at will have a tapered shape so the spring has a range of motion. When towing, we need the range of motion when driving up a ramp into a fuel stop or through a dip in a campground site. The un-tapered bar soon runs out of travel when you go into a dip. Something else will bend instead, usually the receiver, but occasionally, the A frame – whichever is the weaker link. So while an un-tapered bar might accidentally give you more weight transfer, the trade off likely isn’t worth the strain on other components. "On some of these more exotic hitches, the improvement in towing stability and ride comes from a more direct sway control." On some of these more exotic hitches, the improvement in towing stability and ride comes from a more direct sway control. 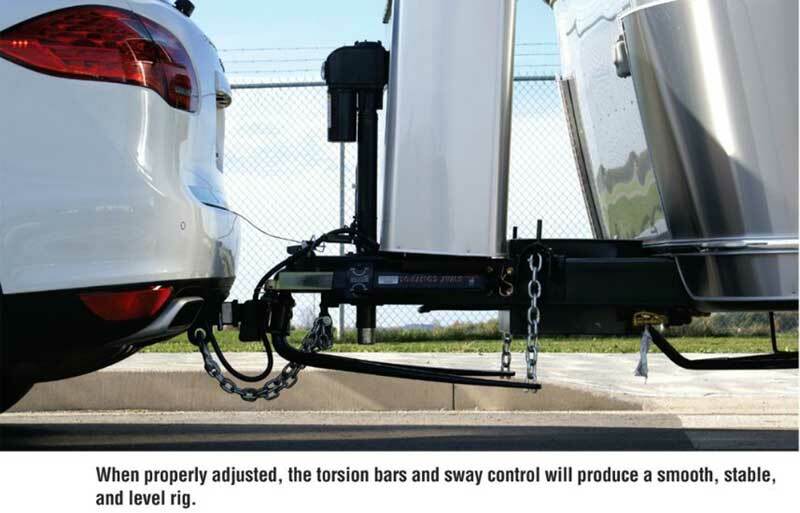 On these hitch designs, the sway control is usually built into the torsion bars which sit on solid brackets on the trailer frame instead of hanging from chains. Other hitch designs use a sway control built into the pivot of the ball. These systems give a very direct acting sway control. On a separate friction-type sway control there is always some play in the ball and socket so the trailer has to turn a little to activate the sway bar. If the weight transfer and a few other details are correct, then it is quite possible that you won’t even notice the sway control’s presence or not – so this tiny bit of play is not something overly critical. However, with the built-in systems the sway control has no play at all which gives a reassuring feeling through the steering wheel even without proper weight transfer. While this might feel ok, there is not likely a lot of depth of control when you really need it. Another concern that I have with some of the new design hitches is that it is not possible to turn off the sway control in slippery conditions. It is important that if you are towing on ice or snow – or even on wet greasy roads – that you should be able to turn off the sway control or you might go straight when you want to turn. Of course, being without proper weight transfer can make the situation worse. The only other downside for many of these hitches is the weight of the ball mount itself. It does not matter to the tow vehicle or trailer but it may be a real pain in your back when you remove it from the receiver. The person who posted the comment online does have a point with his “towing in the dark ages” comment. The weight distribution system we use today is very similar to what we were using 45 years ago. We have learned to fine tune these hitch designs much better now and we understand more about what makes them work. But the basic principle and pieces have changed very little. I am certain that I have tested every hitch out there and, for the moment anyway, I find the conventional weight distribution design with friction sway controls to be the best option for most combinations. Although, I am sure that someday someone will build a better mousetrap. The exception to all this would be a Hensley-style hitch which uses the geometry of its links to eliminate sway without friction but at a substantially higher price. I will be as excited as any RV enthusiast when someone invents a truly innovative weight equalizing hitch design but, in the meantime, here is a quick checklist of things to consider when selecting a hitch. Originally published in RV Lifestyle, Volume 43, No. 2.